Registration for each sport happens within a designated time period. Each sport has its own registration fee. please use your finger to scroll across. Please follow the 5-step registration process for each student for each sport. A) Read the details of your sport, including your sport's General Information webpage and Practice Schedule. D) Carefully read the Athletics Terms for Participation. --> Find the form here. 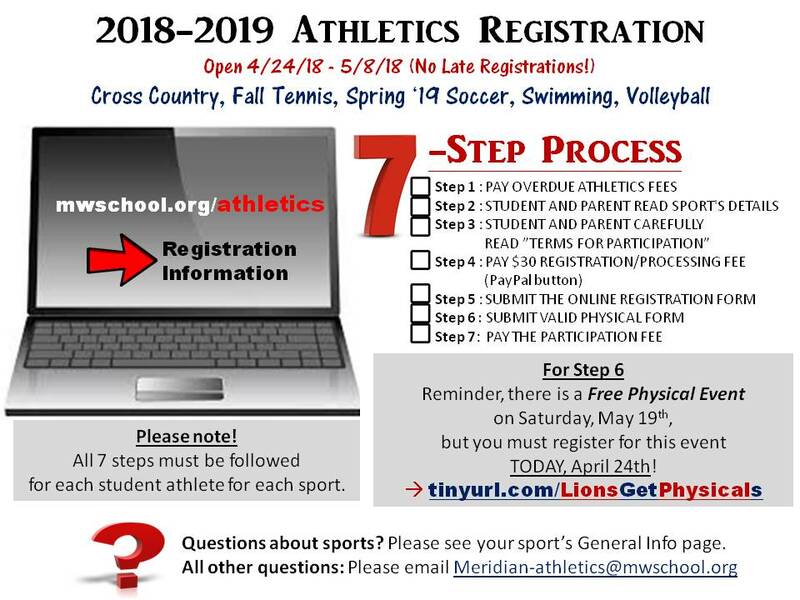 If you have already submitted the 2019-2020 Meridian Athletics Registration Form for the same student for this same school year (2019-2020) and no information collected through the form has changed, you do not need to submit the form again. Make sure all overdue fees owed to the school are paid and payment plans are current. Students who are 10 days or more past due on fees owed to the school are ineligible to participate in Athletics. Login to your MySchoolBucks account to check for open and outstanding invoices. To register for a sport, a $35 registration/processing fee must be paid for each sport for each participant during the sport's registration window. Find the button for your sport's registration/processing fee on your sport's Registration webpage. Find the link to your sport's registration webpage in the table above. Registration webpages are only published during your sport's registration window. No late registrations are available for students who are enrolled at Meridian School during that sport's registration window. A physical form must be on file with the Athletics Department and valid for your sport's entire season by your sport's physical form deadline. Learn more and find access to the Google sheet to check your physical form's expiration date here. Dance Team has a 6th step - Compete and submit the Dance Team Tryout Packet, and then the Officer Tryout Packet for those eligible and interested in an Officer position. Meridian School wants all students to have the opportunity to participate. Financial assistance and/or payment plans are available for those who need it. Please contact financialaid@mwschool.org to request a payment plan or a sport's participation fee reduction.